Most people with an Colostomy, Ileostomy or Urostomy use some sort of skin protective wipe on their peristomal skin, that is the skin around the stoma. There are several brands out there with the popular ones being Smith & Nephew's Skin Prep Wipes, ConvaTec's Allkare Wipes, or Coloplast's Protective Skin Barrier Wipes. There are a few new skin wipes on the market that have some new added benefits! 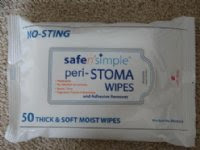 Safe n' Simple Ostomy STOMA WIPES are 5.5" x 7.5" in dimension providing a lot of cloth to use on the skin. Packaged in a resealable pouch designed for travel use and the wipes are flushable. StomaCare Wipes are individually packaged. Each wipe is individually soaked in aloe for extra care for healing and treating irritated skin. Wipes are not greasy and like many of the others are easily fitted into a pocket or purse. Unlike the rest though, is the addition of aloe, something that sets this product apart from the rest. All of these products above are quality made items. We wanted to highlight these lessor known wipes so customers might get to learn about other options on the market. From your trusted source for colostomy, ileostomy, or urostomy supplies, The Parthenon Company is always there to provide the best service at the best price. Guaranteed! The Parthenon Company has sold ostomy supplies for over 45 years as a nationwide mailorder store. Family owned and operated, Parthenon publishes its annual ostomy products catalog and distributes it nationwide to WOC nurses and ostomy support groups of the UOAA.